Oz Hotels allows holiday makers looking for cheap accommodation in Hervey Bay to compare a range of independently owned and non-related hotels, resorts and apartments at the same time. The accommodation on Oz Hotels ranges from luxury resorts and honeymoon suites right through to budget hotel rooms and family friendly apartments. With discount rates for longer stays you can comfortably book your next Hervey Bay accommodation on Oz Hotels and take advantage of the great savings available. Hervey Bay is situated 300 kms north of the Brisbane CBD and is surrounded by 40 kms of pristine beaches. Hervey Bay offers access to islands, adventure, wildlife and a beautiful safe aquatic playground for visitors to the Fraser Coast. The north-facing sheltered waters of Hervey Bay are protected by Fraser Island and offer visitors a perfect swimming and fishing environment. The city of Hervey Bay boasts one of the fastest growing populations in Australia and is renowned for its Whale Watching with humpback whales entering Hervey Bay, between the months of July and November, to spend 3 to 5 days resting before continuing their journey south. The foreshore of Hervey Bay offers 14 kms of shared pedestrian, wheelchair and bicycle pathways, along with numerous areas for picnics, barbecues, children's play areas, beach hire and public facilities. Sanctuary Lakes Fauna Retreat is a unique holiday destination like no other in Hervey Bay.The resort offers 4 star individual melanesian style villas accommodation, all with private lake frontage, set amongst 10 acres of lush tropical nature reserve, teeming with wildlife, yet in the heart of Hervey Bay. Sanctuary Lakes Fauna Retreat provides unique holiday accommodation that caters travellers with an array of budgets. Tucked away in a secluded and tranquil location, it is perfect for a romantic getaway for 2 or a relaxing family retreat. The lakefront villas are surrounded by 10 acres of lush nature, yet just 300m from the best beach in Hervey Bay. Each villa is self-contained with a balcony overlooking the beautiful lake abundant with wildlife, providing the perfect setting for your family holiday or quiet getaway. All villa accommodation is are individually appointed featuring uninterrupted lake views, reverse cycle air conditioning, Queen and Single Beds, kitchenettes private bathrooms, colour TVs, DVD players, and wireless internet access. For your meals, you can either cook in your villa, on our array of barbies near each villa or dine out at a fantastic variety of restaurants minutes from the resort. For your supplies, Urangan shopping centre is minutes away or stroll down to the fish co-op in the morning and select seafood that has been caught fresh daily. Just 300m from the best beach in Hervey Bay, Sanctuary Lakes Beach Resort is priceless. Kingfisher Court is the category winner of the Fraser Coast Business Awards for 2002,2003 and 2005. Located at 374 The Esplanade, Scarness, the large self-contained, two bedroom units are handy to shopping facilities, restaurants, caf?s, banks, hotels and clubs, water sports facilities, boat ramps, jetties, play grounds and bowling clubs. Kingfisher Court is the perfect place for a comfortable relaxing holiday. Hervey Bay is famous for whale and dolphin watching, top fishing, snorkelling, diving spots and world heritage listed Fraser Island. Just down the road you can hire jet skis and catamarans or ride the big banana. Kingfisher Court Resort Apartments provides the ultimate stay, right on the beachfront in the centre of Hervey Bay. The apartments accommodation is spacious and non smoking offering reverse-cycle air conditioning, 2 seperate bedrooms with all linen supplied, a private bathroom, ceiling fans, a seperate spacious lounge/dining room with dining and lounge suite, colour TV, a fully equipped kitchen, full private laundry facilites as well as private balcony. Sample local specialties at Hervey Bays top class restaurants or fry up your catch of the day on the BBQ. The Kingfisher Court Resort Apartments has a BBQ and entertaining area, FREE undercover car parking, a swimming pool and spa, and tour desk. The Kingfisher Court Resort offers DIRECT BEACH ACCESS - to a great swimming and fishing beach. Launch your boat at the ramp over the road or hire one for the day. A well lit walking and bike-riding path runs the entire length of the Esplanade. Friendly, on-site managers are available to help you arrange all your tour booking needs. Kingfisher Court Apartments accommodation provides the ultimate stay, right on the beachfront in the centre of Hervey Bay at very affordable rates. 374 The Esplanade, Scarness, Hervey Bay, QLD, 4655. Arlia Sands Apartments offers 4 star 1 and 2 Bedroom fully self contained serviced apartments perfectly located only 75 metres from Shelly beach, Hervey Bay's best swimming beach. Arlia Sands Apartments Resort is the perfect location for a quiet and relaxing holiday in Hervey Bay, centrally located just off the Esplanade at Torquay with shops, restaurants and takeaways all within a short walk and only 10 minutes drive to Hervey Bay town centre. Arlia Sands Apartments is the ideal base to explore the magic of Hervey Bay, the main gateway to world heritage listed Fraser Island, the worlds largest sand island. Each year, large numbers of Humpback Whales visit The Hervey Bay Marine Park on their Southern Migration from July to about the middle of November. Sailing or cruising is just magic in this undiscovered Paradise where Nature is King. Dugong, turtles, dolphins, sea eagles, pelicans and other creatures share these unique and peaceful anchorages where you can truly unwind. Why not book a Whale Watch Cruises (July - Oct), Fraser Island, Lady Elliot and Lady Musgrave Islands and see for your self. Aside from this Hervey Bay offers its visitors around 14km of beautiful sandy beaches and a chilled out seaside atmosphere to go with it so you simply cannot be disappointed. As one of Queenslands top visitor destinations, Hervey Bay is what Queensland is all about, stunning beach, access to even more stunning islands, a little bit of rainforest and the feeling that you should never go back home. Beautifully appointed, Arlia Sands Apartments Resort is built to capture Hervey Bay's northern aspect with all apartments basking in either the winter sun or summer shade. All apartments are spacious, modern, comfortable and non smoking, beautifully furnished and fully self contained, featuring a private furnished balcony ideal for relaxing and al fresco dining while enjoying the magical views. The apartments further offer air conditioning and ceiling fans, separate spacious bedroom/s with comfortable bedding, private bathroom/s complete with walk in shower/bath, toilet, hair dryer and complimentary bathroom amenities, a spacious separate lounge dining room with lounge suite, dining table and chairs, plasma TV, FREE Austar TV, DVD player, FREE inhouse movies, direct dialling phone, WIFI access, alarm clock, a fully equipped kitchen featuring oven, microwave, full size fridge, dishwasher, tea/coffee making facilities, toaster, cooking utensils, all crockery and iron/ironing equipment. The 2 Bedroom Superior Apartments are larger at 108 metres and have a seperate bath in addition to the shower. Children aged 2 and under STAY FREE OF CHARGE if using existing bedding. The Arlia Sands Apartments Resort offers a wide range of facilities to help make your stay a memorable one. Whether it be keeping fit or simply relaxing in the Spa Jacuzzi, there is plenty to do. Relax in and around the large 11 metre temperature controlled swimming pool, warm in winter and refreshing in summer, set against delightful landscaped gardens or take a 2 minute walk to the fabulous beach. Dine al fresco in the 2 outdoor BBQ facilities and entertaining areas. Further guest facilities and services include a FREE secure undercover parking, luggage storage, communal guest laundry facilities, non-smoking resort, bicycle hire, cot hire, cycle/running path, vehicle wash facilities and continental breakfast packs available for purchase from reception The friendly onsite staff are more than happy to arrange tours. The Arlia Sands Apartments also caters for corporate business travellers with WIFI access in all apartments, faxing facilities and photocopying services. Indulge yourself at beautiful Arlia Sands. Enjoy the quiet surrounds, the best swimming beach in Hervey Bay, superior customer service and luxurious quality accommodation at an affordable price. The Best Western Plus Quarterdecks Retreat provides a refined luxury Harbour Retreat within the Boat Harbour precinct of Hervey Bay and has a wide range of stylishly appointed 1, 2 & 3 bedroom self contained serviced villa apartments. Providing a high quality of service, the 5 star Best Western Plus Quarterdecks Retreat is a sought after property for those people who want privacy away from the busy tourist strip, but still within close proximity to the marina, shops, clubs, cafes and restaurants as well as the adventure of the Fraser Coast. The Best Western Plus Quarterdecks Retreat Hervey Bay Apartments Hotel has been designed with luxury appointments and all apartments boast a contemporary design with a distinct touch of luxury, with private courtyards, security garages, spacious lounges, full kitchen & laundry facilities. The Best Western Plus Quarterdecks Retreat Hervey Bay offers guest facilities for all including a swimming pool, spa, sauna, free car parking, free WiFi internet access, BBQ facilities, entertaining area, concierge, luggage storage, guest laundry and tour desk. Whether you are coming to relax and unwind with your family or escaping on a romantic getaway, the friendly customer service and great Hervey Bay location on the Sunshine Coast, make the Western Plus Quarterdecks the ideal place for a holiday. 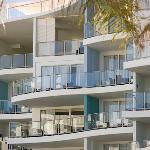 Interstate holiday makers and tourists from around the world will appreciate the luxury beachfront apartment accommodation that is provided by the La Mer Luxury Apartments in Hervey Bay. This quality property is perfectly located on the beachfront and offers guests the choice of luxuriously appointed 1 & 2 bedroom self contained serviced apartments in the hub precinct of Torquay. The La Mer Apartments are modern and comfortable and the beachfront holiday accommodation resort has direct beach access for the convenience of all guests. It is ideally located on Hervey Bay's beautiful esplanade and enjoys a location close to the post office, banks, many cafes and restaurants. The La Mer Beachfront Luxury Apartments is perfectly located for convenience & relaxation to enjoy the tranquility and natural attractions of the Fraser Island and the Fraser Coast. These well furnished apartments are perfect for singles, couples. corporate travellers, families and groups of friends holidaying together with all apartments being spacious, comfortable and designed with practicality in mind. The La Mer Hervey Bay Resort also features a solar heated resort swimming pool, spa, recreation area, direct beach access, free underground car parking, free wireless internet access in all apartments and throughout the resort and a free booking service for tours to Fraser Island, whale watching and the Great Barrier Reef. The Beach Motel Hervey Bay offers hotel accommodation & 2 bedroom self contained serviced apartments set amongst tropical gardens located directly across from Hervey Bay's famous Shelly Beach. The Beach Motel Hervey Bay is centrally located in Hervey Bay between Gympie and Bundaberg and is ideally positioned to explore the famous Fraser Coast. The property is ideally positioned just a short distance from the local shopping centre, pubs, clubs and sporting venues. The Beach Motel Hervey Bay is close to Hervey Bay attractions including the stunning Hervey Bay beaches and the famous world heritage listed Fraser Island and Lady Elliot Island on the Southern Great Barrier Reef. The Beach Motel Hervey Bay offers a selection of Queen Motel Rooms, Spa Motel Rooms and 2 Bedroom Self Contained Serviced Apartments. The Green Motel & Apartments also offers an excellent range of guest facilities and services including large landscaped swimming pool, Spa/ Jacuzzi, direct beach access to a stunning calm water beach, tour desk, on-site internet, poolside BBQ & entertaining area, fully licensed restaurant, room service, FREE undercover parking and much more. The Hervey Bay Green Hotel Motel & Apartments offers clean, comfortable, affordable accommodation in a fantastic Hervey Bay location, ideal for business travellers and holidaymakers alike. The Fraser Coast Tourist Park is an award winning holiday park that offers a range of accommodation including studio units and deluxe family sized cabins. This family operated accommodation in Hervey Bay is perfectly situated only 200 metres from the magnificent beach and Esplanade. In fact the Fraser Coast Tourist Park is so close to the beach you can actually hear the sounds of the waves. Also the Fraser Coast Tourist Park is only a short 5 minute drive from the WetSide Waterpark and Hervey Bay Historical Village & Museum, as well as having the Hervey Bay Bowls Club located next door and several other dining and nightlife options within easy walking distance. Staying at the Fraser Coast Tourist Park you will have hours of entertainment in the enormous recreation room complete with pool table and other games, swimming pool, spa, guest kitchen with pizza oven, guest laundry, internet kiosk, tour desk, BBQ facilities, guest library and much, much more. The Australis Shelly Bay Resort has a number of 1 & 2 bedroom self contained serviced apartments that enjoy a fantastic, beachfront position and are facing straight over to beautiful Shelly beach. Positiones at the best swimming & fishing beach in Hervey Bay the Australis Shelly Bay Resort, Hervey Bay is centrally situated on the Esplanade and local tourist strip, just a short stroll from restaurants, cafes, shops, pubs and many beach activities. Australis Shelly Bay Resort is the ideal gateway to Fraser Island with a tour desk that are happy to arrange trips to Fraser Island with free transfers. All apartments at The Australis Shelly Bay Resort, Hervey Bay are air-conditioned and feature LCD TV with FREE cable TV, FREE WIFI, a fully equipped kitchen, laundry & north facing balcony with stunning bay views. The Australis Shelly Bay Resort, Hervey Bay offers a walk-in resort lagoon-style swimming pool, half-size tennis court, fully licensed restaurant, tour desk & free undercover secure basement parking. The Australiana Top Tourist Park is ideally set amidst 6 acres of beautiful tropical gardens and prides itself on providing travellers with a range of award winning cabin accommodation that is cenral to everything in Hervey Bay. The Australiana Top Tourist Park is located only only 800 metres to Scarness Beach, shops, cafes, entertainment, bowls and many fine dining restaurants. River Heads Ferry Terminal is a 20-minute drive away, providing access to Fraser Island and the Australiana Tourist Park is also within easy access to the Boat Harbour. Australiana Top Tourist Park offers numerous, quiet and secure accommodation options, all of which are spacious, fully self contained and immaculately clean. The guest facilities at the Australiana Top Tourist Park include outdoor swimming pool, beautiful tropical gardens, sun terrace, BBQ facilities and entertaining area, games room with pool table, soccer, table tennis and air hockey games, Free Wifi Internet access, guest laundry facilities, bicycle rental, guest library, free car parking, free DVD hire, tour desk, luggage storage and cot hire. The Akama Resort, Hervey Bay - the newest five star resort in Hervey Bay, offering 1, 2 & 3 bedroom luxury self contained apartment & penthouse accomodation.The Akama ...where every exquisite detail has been attended to, with your comfort in mind. Akama Resort is one of those unique five star properties that stand out from the rest. Idyllically situated on the esplanade in the marina precinct at Urangan, away from the hustle and bustle of the main accommodation strip, Akama resort features magnificent views overlooking Fraser Island and the Great Sandy Straits and where all whale watching and Fraser Island tours depart. A stones throw from the Hervey Bay Marina is the restaurant centre of Hervey Bay, where bars, restaurants and fine food will titillate even the most discerning palette. The Akama Resort offers unrivalled luxury and space not often seen in holiday accommodation, offering every modern amenity in a vast contemporary layout not often seen in holiday accommodation. Entertain with ease in large open plan living, where concertina glass doors open onto private, sunny balconies with stunning views across the Great Sandy Straits to Fraser Island. All apartments have 2 bathrooms!! The apartments further feature very large and spacious living areas as well as balconies much bigger than most, ducted airconditioning and ceiling fans, 106cm plasma TV in the living area, a 66cm LCD TV in main bedroom, stereo, DVD player, direct dial phones, full laundry facilities, three high speed broadband outlets per apartment and free Austar. The kitchen is stylish and more than well equipped, including sparkling cedar stone benchtops with glass splashbacks and top of the range stainless steel appliances. We believe all the little luxuries count. Full size concertina glass doors open the width of the living area bringing the outside in. The penthouse apartments have uninterrupted views across the Great Sandy Straits to Fraser Island. Large market umbrellas and sunlounges fringe the beautiful heated sparkling pool and spa, the large BBQ area has tables and chairs under-cover with male and female toilets and showers. Come and see the fish that swim up the side of the building, also along the bottom of the pool. Further features include free tour bookings, lifts to all levels, keyless entry, secure under-cover parking and boat storage is available. Onsite managers for added security. Whether you're looking for action, relaxation, romance or a fun family getaway, Akama Resort - Hervey Bay, has it all. The accommodation at the Oceans Resort and Spa Hervey Bay consists of a range of one, two and three bedroom serviced apartments, all featuring a luxury Spa Bath and private balcony. The Oceans Resort & Spa is conveniently positioned close to the Hervey Bay Esplanade and Marina precincts, which are home to a wide range of shopping and quality dining experiences, Oceans Resort & Spa Hervey Bay is only 10 minutes drive from the Fraser Coast airport and two hours from the Sunshine Coast. The Oceans Resort & Spa has excellent resort style facilities which includes a heated lagoon swimming pool, landscaped gardens, childrens pool, on site day spa, Bayswater Bistro & Bar, daily housekeeping and high speed internet access in order to make you feel right at home.